Which Costly Family Most Deserves to Enter the Moocher Hall of Fame? But it’s not limited to Americans. Previous winners of this prestigious award include Brits, Austrians, Greeks, and Danes. Now it’s time to pick a new honoree. But we’re going to make this a contest. We have two families living in the United Kingdom, both of which impose a big fiscal burden on taxpayers, but only one of which gets to join the Moocher Hall of Fame. Here’s contestant number one. As reported by a British tabloid, a Romanian couple, along with their 15 kids, are imposing a very heavy cost on British taxpayers. 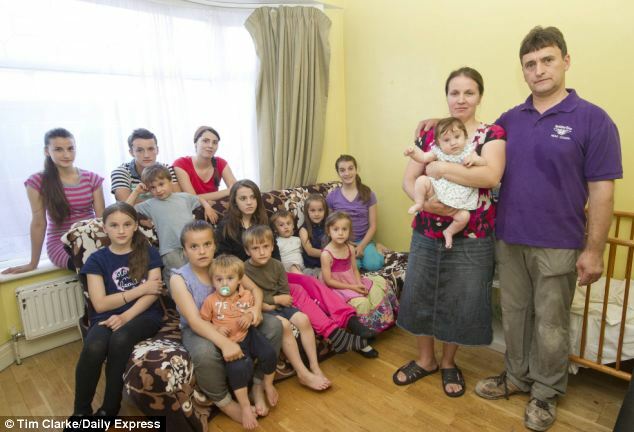 Mihai Toma and his brood live in a three-bed home after moving to soft-touch Britain two years ago. They rake in £2,500 a month in tax credits, £1,400 in housing benefits and £700 in child benefit… That adds up to £55,200 a year in handouts – the equivalent of a £90,000 salary… It means Mihai is making more than many doctors, senior police officers and MPs. …the Toma family want even more. They are demanding to be moved to a bigger taxpayer-funded house for their children aged four months to 19. And they cannot understand why so many hard-working Brits unable to afford their own homes are angry. Mum Veronica, 37, said: “…People will judge us but we have not done bad because we have come here to get a better life than in Romania.” …The Tomas are among thousands of immigrant families who have flocked to Britain as “welfare tourists”. I have nothing against big families, but demanding a bigger house that will be financed by other people definitely rubs me the wrong way. And here’s contestant number two, as described in another story also from the Daily Star. The Sisarovas are a Slovakian family with 11 kids. Katerina Sisarova, 43, left Slovakia in 2007 and has worked for just one month after settling here. …But with her £23,000 annual income from handouts, gypsy Katerina doesn’t want a job. She said her life was “very nice” and she’ll never go home. Katerina bragged: “We have a good life here. We have everything that we want. …Her husband Peter, who has not worked for two years, added: “I like England. England give me house, give me doctor, give school, benefit. England good, thank you so much England.” …Her daughter Petra, 20, lives in a council house nearby with her son Peter, three. She also lives on handouts, collecting £650 a month, and said: “I get child benefit, tax credit, housing benefit. I’ve got a better life here than in my country. So which family is more deserving of entering the Moocher Hall of Fame? To put this in American terms, the Sisarova family is akin to a household where everyone goofs off while collecting welfare (and assorted additional benefits based on no income). In the Toma family, by contrast, someone is working, so that makes them akin to an American household that is eligible for the earned-income credit (and assorted additional benefits based on modest income). And the difference is that welfare is money you get from the government for doing nothing while the EITC is money you get from the government for working. Getting back to our contest, Mihai’s decision to be partially self-sufficient means he and his family don’t get to join the Moocher Hall of Fame. By the way, there’s also a Terrorist Wing of the Moocher Hall of Fame. It features repugnant people like the Tsarnaev family in the United States, as well as Abdul, the million-dollar moocher from Australia. We don’t have any new nominees for the Terrorist Wing, but here are a couple of stories that should probably be in the honorable mention category. First, the Daily Telegraph from the U.K. reports that home-grown terrorists are using government handouts to wage jihad. Terri Nicholson, from the Metropolitan Police’s counter-terrorism command unit, said that taxpayers’ money was being claimed fraudulently and used by terrorists in countries such as Iraq and Syria. She said there had been “a number of cases” recently of terrorists making fraudulent student loan claims to fund their activities. …“We are seeing a diverse fraud, including substantial fraud online, abuse of the benefits system, abuse of student loans, in order to fund terrorism,” she said. I’m particularly struck by the use of student loans. Many of the people I knew in college used such payments for beer, but they obviously weren’t thinking big enough. I guess we should count fighting for ISIS with taxpayer money as some sort of self-directed independent study. We have similar problems in the United States. I’ve already mentioned the Tsarnaev brothers, but we also have two men who wanted to blow up the Gateway Arch in St. Louis and kill two officials. But they had one small problem. They couldn’t afford to buy the bombs they wanted until one of their girlfriends received her next installment of handouts from Uncle Sam. Two men indicted last week on federal weapons charges allegedly had plans to bomb the Gateway Arch — and to kill St. Louis County Prosecuting Attorney Robert McCulloch and Ferguson Police Chief Tom Jackson — the Post-Dispatch has learned. …the two allegedly did buy what they thought was a pipe bomb in an undercover law enforcement sting. The men wanted to acquire two more bombs, the sources said, but could not afford to do it until one suspect’s girlfriend’s Electronic Benefit Transfer card was replenished. Gee, if only handouts were even more generous. Then those two guys could have planned more efficiently. Though I shouldn’t joke. If these guys hadn’t been such morons, some people might now be dead. Let’s close on a more serious note about public policy. It should go without saying that the vast majority of welfare recipients aren’t terrorists, or even criminals. And most of them presumably don’t have the extreme entitlement mentality illustrated by the Sisarova family. But that doesn’t mean welfare should be an acceptable way of life. It’s bad for taxpayers when that happens, of course, but it’s also bad for recipients. And this is becoming apparent even to some foreign politicians who are far from being libertarian. Here are some excerpts from a story published by the Independent in Ireland. Social welfare has become a “lifestyle choice” for many leaving school, a situation which is totally unacceptable and will no longer be tolerated, Social Protection Minister Joan Burton has said. “What we are getting at the moment is people who come into the system straight after school as a lifestyle choice. This is not acceptable, everyone should be expected to contribute and work,” Ms Burton said. Speaking to the Sunday Independent, Ms Burton said those who failed to cooperate with her department by not taking job or training opportunities would lose up to €44 a week. My gut reaction is that they should lose everything, but I guess this is a big step from a Labour Party politician. It appears Ms. Burton recognizes that people can be trapped into a life of dependency if the welfare system is too generous. Which is a revelation that also has occurred to at least one American leftist. P.S. Guess what happened when politicians in Washington declared “war on poverty” and started spending lots of money? P.P.S. On the other hand, guess what happened while politicians in the U.K. decided to make dependency a less attractive lifestyle? P.P.P.S. Here’s a map showing which states have the biggest welfare benefits. P.P.P.P.S. I can’t help but wonder if the British press focuses on immigrant households that collect welfare while paying inadequate attention to the equally disturbing anecdotes of home-grown welfare families. The problem is welfare, income redistribution, and dependency, not the race or nationality of the recipients.